Sheila Harsdorf was appointed as Ag Secretary by Scott Walker leaving Senate Seat of District 10 open. There is a special election on January 16th for this important Senate seat. Republican state Rep. Adam Jarchow will face Democrat Patty Schachtner in a special election in western Wisconsin to replace state Sen. Sheila Harsdorf.Jarchow, of Balsam Lake, beat fellow state Rep. Shannon Zimmerman of River Falls in Tuesday’s Republican primary, according to Wisconsin Public Radio. Schachtner, the chief medical examiner for St. Croix County, won a three-way Democratic primary.Libertarian Brian Corriea is also running in the Jan. 16 special election.The seat came open when GOP Gov. Scott Walker appointed Harsdorf, a Republican from River Falls, to be his agriculture secretary last month.The district has long been held by Republicans, but Democrats argue they have a shot at winning given successes by their party around the country this year. Republicans control the Senate 19-13.In the GOP primary, Jarchow had 56% of the vote and Zimmerman had 44%, according to unofficial results cited by Wisconsin Public Radio.Schachtner got 70% of the vote in the Democratic primary, besting John Calabrese of Glenwood City and Reuben Herfindahl of River Falls. Overlooking that he is pirating a trademark of Dr. Seuss Enterprises, he is then showing us an image of his opponent, Ms. Schachtner, being hung by the Grinch. Apparently it is ok to threaten death upon your opponent in Wisconsin, knowing that the Attorney General will never prosecute a fellow Republican and any attempt by Dr. Seuss to sue for trademark infringement will end at the Wisconsin Supreme Court. One party rule is working very well for the one party, not so much for the rest of us. If you are in the 10th Senate District, do you really want to reward someone who thinks its funny to threaten his female opponent with a hanging? I guess that is why Mr. Jarchow made such a good delegate for The Donald, at the Republican National Convention. At what point do we hold our elected leaders accountable for their actions? Al Franken was just forced out of office for an old photograph while he was on a comedy tour, and it is now time to hold both sides up to the same high standards! (Standards SHOULD be high)! Please contact Adam Jarchow and let him know that as someone who wants to represent the people that you expect more and an apology! Ask Adam how he would feel if that was his wife, mom or daughter depicted being hung on a billboard for everyone to see! Edit note: A couple other things stand out to me from the billboard. 1. One of the two things that Jarchow focuses on is drug testing welfare recipients and calls Ms. Schachtner out for not supporting that program. Since it has been ruled UnConstitutional, she should be commended for her stance there! 2. 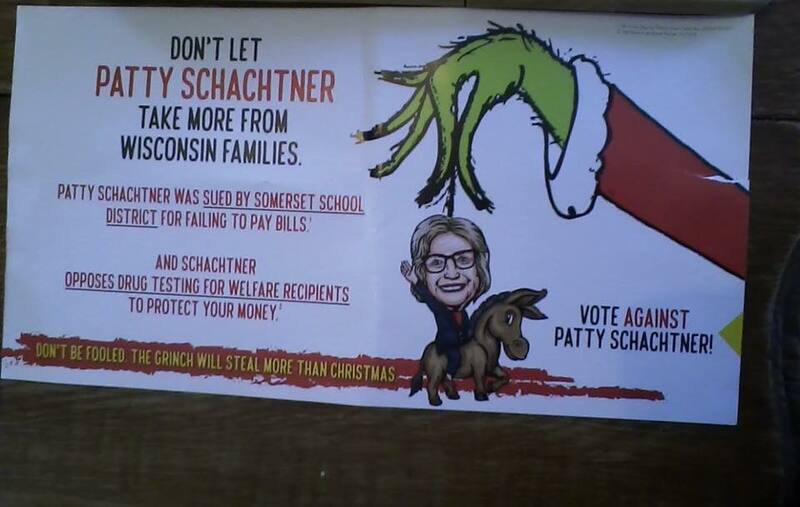 The line "Vote AGAINST Patty Schachtner" is a telling one. When you have nothing to run on, all you can do is trying and smear the competition. I hope at some point, if Mr. Jarchow does manage to win, that when he says the people have spoken and they want more of the GOP policies, that someone has the cajones to point out that he is running on how scary that his opponent is and not anything about what the GOP has done the last 8 years of one party rule! The Kochs and other RW dirty money groups sure seem scared about this race, don't they? If Jarchow and GOP policy were worth a damn, they wouldn't have to try the smears and lame talking points vs Patty. All the more reason to get behind her.